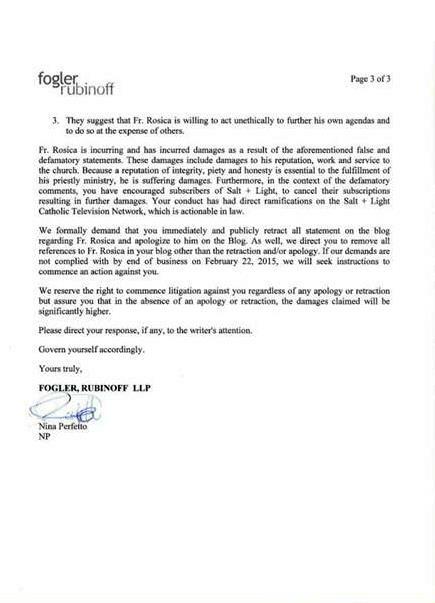 On Shrove Tuesday, February 17, 2015, I received a letter from Nina Perfetto, a Litigation Solicitor with one of Toronto's most expensive law firms, Fogler Rubinoff. The threat of a lawsuit was from Father Thomas J. Rosica, a Basilian priest, Executive Producer of Salt + Light Television, Consultor to the Pontifical Council on Social Communications, English-language Synod spokesman for the Holy See and member of various academic institutional Boards. A few weeks later, after incredible international pressure and bad publicity, intervention by Cardinals of the Holy Catholic Church, letters and other pressures, he dropped the lawsuit saying, "it was never intended" and that the lawyer was working "pro-bono." This post shall remain through this front page link permanently as a matter of public record. My thanks to Raymond Leo Cardinal Burke and Bishop Athanasius Schneider. this is just brutal! I will pray for you and your family. Father so and so has been on many persons radars for a long time. He likes attention, good or bad. This might just backfire right in his face. Trust in Jesus! At the onset of Lent yet. I'm sorry, this is wrong, and we are praying. I would like to know if the action against Vox Cantoris is to be in a secular court. I'm no expert, but in my mind any action against a practicing Catholic should be dealt with under Cannon Law as it does not concern secular issues. Disputes concerning the Church should be dealt with in the Church. If it is any consolation, this is a tactic of a desperate priest trapped in a corner like a rat. The majority of people quietly cave to the threat. The best thing you have done was to expose it. We will raise such a stink in blogosphere, it will be the sorriest strategy they ever tried! Is there anything we can do to help you? If there is please say something!!!! At this point it seems you are dealing with an agent of the devil in Rome and I for one am willing to help you wage war against this cretin rosica or whatever his name is. I have a copy of theletter you were sent and am going to be repostin g it EVERYWHERE. Stay to course. You are doing a great and necessary work. Don't fear the possibility of a lawsuit. I have no doubt that you will have all the support you need to prevail against that spawn of satan. What a hypocrite and tiny little man Fr. Rosica is. Fr. Rosica is showing his true colours. He obviously feels threatened. One would have thought that, confronted with his misbehaviour, he might amend his ways rather than compound his actions with additional bad acts. Sadly, Fr. Rosica has chosen to act poorly, again. Be wise as a serpent; gentle as a dove! How does the scripture passage go? "If your brother sins against you, go and hire a law firm to make an unfounded threat of lawsuit for defaming your fine character". No... I don't think that's quite it. This situation is quite incredible. I hope you stand your ground. I would suggest that you post a link to each entry that Rosica has taken issue with. Then give permission for other bloggers and individuals on the internet to copy and reproduce them on their own blogs and sites. Let's see how many targets Rosica can hit. You have prayers and support from my family in southern California. my prayers are with you, your in my Rosary tonight . Your in my prayers tonight. a rosary of our Lady for you. The DEUS EX MACHINA Blog supports you and you efforts. You are in our prayers!. "Oh, yeah, all the time. There's a certain form of Taliban Catholicism out there right now that would like to dictate everything and, really, it doesn't speak to the future." Who is wearing the dictatorial turban now, Fr. Rosica? You have my support, sir. Can you post the list of articles you are being asked to take down? Let us all read for ourselves what you are being accused of and I'm sure you will find many people rally to support you. Ches of The Sensible Bond. Prayers are powerful, but what the Vox really needs is support from the Catholic blogging community. Report this attack on your own blogs. Research the subject and offer your own conclusions. As I understand things the Vox has only commented on things Rev.Rosica has stated publicly. There's nothing in civil or canon law preventing that. Freedom of speech and expression is enshrined in our various national constitutions. Prayers, love, and peace from Boston. I don't have a blog Vox but You are supported in my rosaries ! This is an authentic Catholic Blog and much needed...stay the course, faithful Catholics are with you! Satan is getting desperate....perhaps the time of his 'long leash' is coming to an end? Stay strong...God WILL defend you. I have never been to this Blog, but watched Michael Voris' episode on this outrage today. For what it's worth, I do think that some of these 'Prelates' that threaten faithful Catholics are counting on their victims 'taking their marbles and going home', as has happened so many times in the past. Hop on over to the 'Tenth Crusade' on this matter, a very good analysis. I do also think that this may get into the mainstream media as I saw this on Britebart this morning. Also I saw it on 'Restore DC Catholicism'. This will go pretty much viral and you will have (I'm sure) hundreds of thousands of faithful Catholics behind you....and standing WITH YOU. We are most definitely at war, so we must 'put on the armor of God.' I don't think the good Fr. or the Vatican for that matter is aware of the opposition, but they will soon enough! You are in my prayers and my Rosary and I'm sure along with thousands of us. Remember this...in the end.....it is not the dissenters who win. Remember that there is nothing more intolerance than the "tolerance" crowd. The modernists running Rome will tolerate every kind of evil sin and perversion and call it liberty, but you are not apparently free to tell the truth about it. This looks like blackmail to me. If I were you, I would hire the ACLJ and countersue. Maybe the millions you win can help fund the Restoration movement. Blackmail is an act, often a crime, involving unjustified threats to make a gain or cause loss to another unless a demand is met. It is coercion involving threats of physical harm, threat of criminal prosecution, or threats for the purposes of taking the person's money or property. Source: Wikipedia / blackmail. Call the ACLJ and hopefully you can counter-sue. P.S. If possible, post this message publicly, so that other traditional Catholic bloggers may learn about anonymity and how to post their blog posts without fear of reprisal. Yes, your fellow bloggers will be there to help in any way we can. The only good thing about this episode is that it clearly depicts their desperation. Anyone can threaten to sue or sue; winning is something else. I'd get legal advice and call him bluff. I don't think that the Pope of Mercy will like these bullying tactics one bit. I don't think the negative publicity will be welcomed by the Vatican. The secular press that was so harsh on Pope Benedict will not be able to defend this either. Father Rosica is overplaying his hand here --he has no idea how much (partly because he seems to have a history of this.) The secular press may like Francis but they still don't like priests. And despite the "Francis effect" most lay Catholics still dislike this type of clericalism and do not like seeing priests bullying the laity. Stay joyful, pray continually and give thanks whatever happens. We will certainly be praying for you. Under common law, a defamatory statement has to be a factual statement, and not an opinion. Here, the allegations do not even suggest that you have made a factual statement but rather "suggest" that Rosica is dishonest and untrustworthy and willing to act unethically. They do not even rise to the level of opinions because they seem to only "suggest". (Canadians are obviously too polite to know how to properly defame a person.) IMHO, this is just a nuisance lawsuit meant to scare you into shutting up. Just heard about this today. It's scandalous that a priest is threatening to sue you. you have my prayers and support. Words to recall "I spoke of thy testimony before Kings, and I was not ashamed." Wow! What are they accusing you of - inaccurate facts? Or is it just your opinion that they didn't like? Big difference! I will be praying for you. Pray to St. Francis de Sales, too. I hope you get a hot shot lawyer and scare them away. Anonymous 11:45, you are too optimistic. "The pope of mercy" is using his spokesperson and the same bullying tactics he applies to minimize the gravity of mortal sin, to vilify faithful Catholics. It is a well thought-through, collective, deliberate effort. Evil is real and the host of this blog is not safe. When Rosica asks whether there is nothing good in adulterers or homosexuals, as an argument to ignore their unrepeated sin (as defined by God) he deliberately uses fallacy on the dumbed-down populace ready to embrace immorality and one world religion. These people set out to harm and destroy all thinking, honest Catholics. I would prefer to be wrong about this, but it is highly unlikely. Is the good Father and his law firm ready for discovery? You can dig into all his records and past statements in the course of preparing a response to a lawsuit. This guy is a public figure and has a very long and extensive paper trail. If they can't help you, they may suggest another resource. I find this news to be disgusting. As soon as I heard last night, I posted about it on my blog. Today, I have posted an examination of Father Rosica's essay on Sunday's Gospel of the temptation of Jesus. He actually wrote that the desert sun and the pangs of hunger and thirst conjured the devil, or, in other words, that Jesus hallucinated and had a mirage. That's how he begins and it gets worse from there. We will be glad to send in a donation, if needed, towards a legal fund in your defense. Please post a link in your blog if you start one. God Bless you in all your work. Don't be intimidated by fancy letterhead from a law firm. we have your back. I've never heard of your blog before but someone in my diocese shared it on his facebook page because of what Fr Rosica is doing to you. What an outrage!!!! There are many many Catholics behind you, we've got your back! Don't give in, I for one and I'm sure many others will help you pay for legal fees if you set up a gofundme account or something if the need actually does arise. There are two good things about all this though. One, now you know higher up Vatican officials are reading small blogs by lay Catholics. And two, your blog will have wider readership. Yay! Don't give in! Praying for you and yours. God bless, from a young adult living in Hamilton Diocese. I see Rosica and the gang at the Vatican couldn't even hire a Catholic (sic) law firm to write up the complaint. But, sheesh, I forget, it's our 'elder brothers in faith' who really have it ALL GOING ON now, don't they? You may wish to start a crowd funder for your defense against the powers of darkenss Mr. Domet. 1) Let Fr. Rosica know my thoughts about this matter. This is a malicious abuse of the legal justice system for the purposes of intimidating you and persecuting you. There has been no defamation. Fr Rosica ought to be sued for misrepresentation as he purports to be a faithful priest of Christ's Church while attacking the Faith and morals. Blessed are those who suffer in the cause of right. There's is the Kingdom of heaven. Thank you for your fidelity to the unchanging Faith and the morL law, your work for the Church and the salvation of souls. The good are always a target of the devil. You must have been doing a lot of good. God bless and protect you and your family and keep you strong in the Faith. This is just the heretics in Rome trying to close down the faithful blogosphere before the Synod in October. They know that there are bishops and Cardinals who will feed information to bloggers to circumvent the manipulation of the process which Rosica appeared to be part of last time - in my opinion of course. Everything I have read about him on your blog merely amounts to an analysis of his words and opinions which he himself put out into the public domain. His only legitimate complaint is that you obviously disagree with him - and that is not against the law in any country I know of. Keep up the good fight and don't give in to his bully-boy clericalism. He has no more claim to a monopoly on opinion than you or I do. Its about time he experienced being humbled by the "god of surprises". Thanks to Rorate Caeli I have found another great blog site that defends the Roman Catholic Church founded by Jesus Christ. He has been a bully-priest since the beginning. I always thought it would be better not to give him more attention than he deserves. You have our prayers. And I have linked your blog to mine. "DARE any of you, having a matter against another, go to be judged before the unjust, and not before the saints? 2 Know you not that the saints shall judge this world? And if the world shall be judged by you, are you unworthy to judge the smallest matters? 3 Know you not that we shall judge angels? how much more things of this world? 4 If therefore you have judgments of things pertaining to this world, set them to judge, who are the most despised in the church. 5 I speak to your shame. Is it so that there is not among you any one wise man, that is able to judge between his brethren? 6 But brother goeth to law with brother, and that before unbelievers. 7 Already indeed there is plainly a fault among you, that you have lawsuits one with another. Why do you not rather take wrong? Why do you not rather suffer yourselves to be defrauded? 8 But you do wrong and defraud, and that to your brethren. 9 Know you not that the unjust shall not possess the kingdom of God?" Rosica's attack led to this blogger discovering your great blog (through a post by Mundabor). God bless you and may his angels protect you. Jesus, in Matthew 18, shows the proper way to address a perceived wrong with a fellow believer. It is disconcerting to see some who are in leadership positions continually to disregard God's Word's in deeds and actions. God bless guide and protect you for your faithful witness. I am beyond disgusted by the actions of this man. Please start a request for donations to defend yourself. I will support you, I would consider it an honor. I am a Filipino Traditionalist who is Interested in all Things Canuck. Having said that,you are in My Prayers. I am a U.S. attorney. I can assist you in locating skilled Canadian counsel. I will also donate $1,000 to a legal defense fund for you. Feel free to contact me if I can be of any assistance. Shame on you, Father Rosica. Fr. Rosica is the English Language Spokesperson for the Vatican! ie: for the Pope! Is it any wonder that there is such confusion every time there is a public statement made by the Vatican? And we all have to try and figure out what the Holy Father really said??? If there is true defamation, it should be removed. On the other hand this is true to Rosica's character as a priest-bully. This is simply stupid and counterproductive. I will reproduce this in my blog Thyself O Lord, that has the honor to have you as follower. "Canon 212 §3. According to the knowledge, competence, and prestige which they possess, they have the right and even at times the duty to manifest to the sacred pastors their opinion on matters which pertain to the good of the Church and to make their opinion known to the rest of the Christian faithful, without prejudice to the integrity of faith and morals, with reverence toward their pastors, and attentive to common advantage and the dignity of persons." The entire legislative and judicial history of the Catholic Church (including the counsels of the New Testament) urges the members of the Church to resolve differences within the Church rather than at common law, Canadian or otherwise. Vox Cantor appears to have relied on the letter of Canon Law (cited above) and therefore under civil/tort/common law 'detrimentally relied' on the Church Herself, i.e. Father Rosica's employer, to speak boldly. Therefore I believe the matter is estopped on the civil side and must proceed to be heard in the ecclesiastical courts. Call Salt and Light TV at 888-3027181 and voice your displeasure, I just did. So sorry that you are being put through this by a member of the clergy. Prayers from Ireland for you and your family. Further to my earlier comment about equitable estoppel and Canon 212 §3., I would immediately file an ecclesiastical/diocesan appeal to the appropriate local tribunal asserting that the threat of a civil lawsuit in this instance is not only a violation of Canon Law but also directly contrary to the historical and theological counsel of the Gospel and the Catholic Church throughout history. Could you write me privately at voxcantoris@rogers.com ? Catholic bloggers who care about the faith and believe in freedom of expression should be worried and concerned. Are we to be afraid of what we say and post about for fear of being sued? We hope and pray that this can be resolved without the courts for the sake of the Church and the well being of the parties directly involved. If it becomes a court case, count on me Dave to help with prayers and other support. Please consider also to write to the following superiors of Fr. Rosica to express your concerns about this unjust situation. I stand with Mr. David Domet. He has done nothing wrong in expressing his opinion based on facts. I am truly appalled, like many of my fellow Catholics, that Father Rosica would threaten him with a lawsuit. Father Rosica can defend himself and present his case in the blogosphere, just like anyone else. This lawsuit is mean-spirited and unwarranted! This threat has caused Mr. Domet great consternation and I ask that you help him in any way you can so that this lawsuit is withdrawn immediately. Just emailed this, cc. light and salt tv--Hang in there, amigo! Just emailed Vatican (info@news.va, cc. salt tv) in Pope's own language-mine too! Don't worry my friend, you are in Our Lady's hands! Por favor ayude a nuestro hermano, David Domet, de Toronto, Canadá, quien ha sido amenazado con una demanda legal por el Padre Thomas Rosica. Ud. muy famosamente nos ha dicho que "hagamos lío" y que desafiemos a las autoridades eclesiásticas expresando nuestra opinión. El Señor Domet no ha difamado a nadie. El Padre Rosica puede expresar sus opiniones en el internet como todo mundo. Una demanda legal por parte del Padre Rosica en contra del Señor Domet es maligna y va en contra de la libre expresión de los fieles. That legal letter is joke? Prayers from England for your wellbeing. Rejoice! And be humble! You are suffering in the Name of Our Lord. Our prays and our support. Thats a Gift. As a Catholic and a Catholic blogger, I am appalled that Fr. 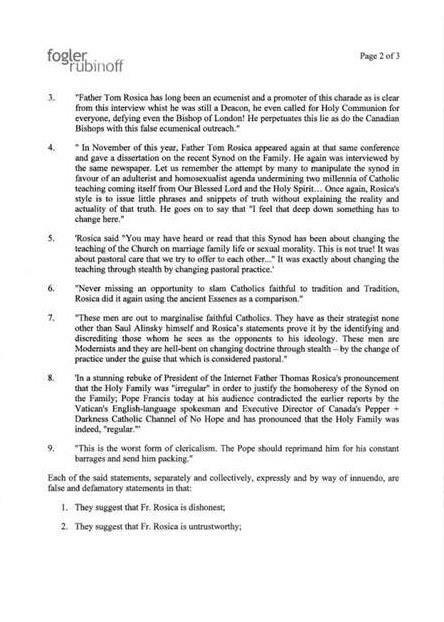 Thomas Rosica--who you have entrusted with authority and responsibility--has unjustly attacked a Catholic blogger in North America, where we have freedom of speech. Ironically, David Domet of Vox Cantoris is being attacked for telling the truth about Fr. Rosica's despicable remarks, the most egregious being Fr. Rosica's claim that the composition of the Holy Family was "irregular." Please remove this scandalous priest from his Vatican position. [blogger at] "Dorothy Day Another Way"
Hope Rosica's suit backfires and blows the blowhard out of the water! We're praying for you. Clearly, based on all the comments here and this story being catapulted into major media (e.g., Breitbart), Rosica's suit is having, and will continue to have, a profoundly opposite effect than he intended, i.e., to silence criticism of his heretical endeavors. Indeed the 9 Vox Cantoris points are getting out 100 fold more now, BECAUSE of his suit. The beauty of it is that, at least for those of us here in the U.S. where such a petting law suit would surely fail due to 1st amendment protections, there is NOTHING Rosica can do to remove this discussion from public airing. He can go pound sand. I realize Canada’s speech protections aren’t as strong, but I will do what I can including prayer and spreading the word, and also financially to help you defend yourself against this outrageous lawsuit. I call on others to do the same. We must protect our Catholic brothers in Christ when faced with such oppressive forces. I follow several conservative Catholic blogs, but until the Breitbart article on the lawsuit I wasn’t fortunate enough to come across Vox Cantoris. I’ll be pointing others to this blog. I suggest faithful Catholics raise a ruckus with their individual parishes and priests, including making clear that some of your normal parish donations will instead be set aside to help David Domet, a fellow Catholic under siege. Perhaps that will help send a strong message upstream to the Vatican that such intimidation tactics will not be tolerated by the Catholic faithful. Please, I say to you in His Holy Name: do not let your Spirit be troubled by this. Unite yourself to the Patience and Suffering of Beloved Jesus. I know you have a great desire to protect Holy Mother Church which is pleasing to the Most Sacred and Most Immaculate Hearts. You are in the Prayers of the Heavenly Court. Greetings from Spain. Stand up against this hypocrite Rosica. He can't sue every Catholic blogger. I have written a post in support. Am I mistaken, or is Rev. Thomas Rosica, OSB, a Canadian Basilian too? 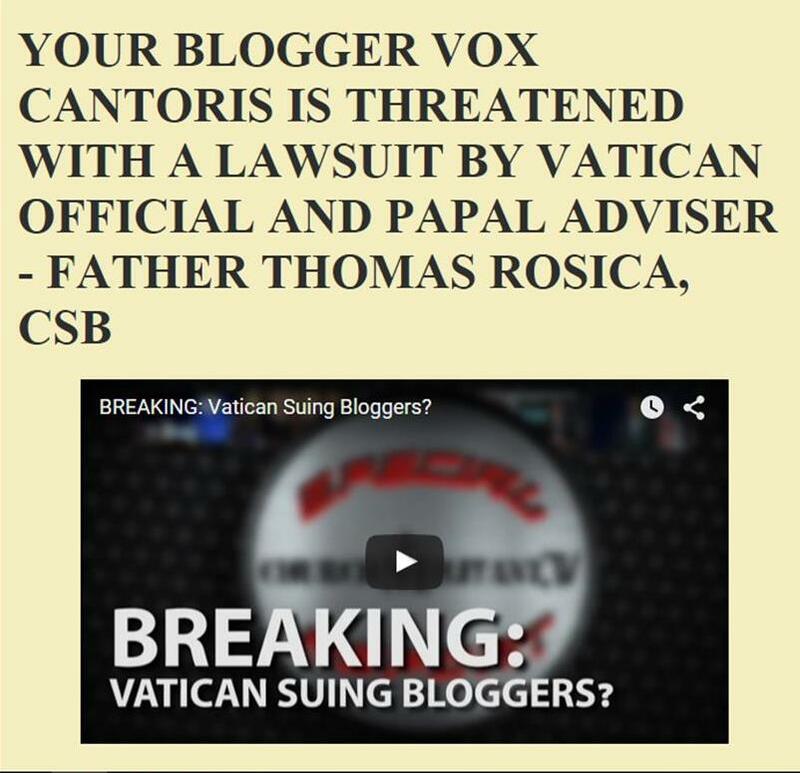 Rosica being the plaintiff in the very recent defamation/libel suit against the Canadian Blogger here at Vox Cantoris? Really!! We have to stand up to these arrogant prelates. Praying for you and your family. Don't give up! Fr Rosica is clearly bringing the Church into disrepute by his unChristian actions. I trust that the Holy Father will soon intervene and send him off to some quiet remote parish with no internet connection. should you find this comment inappropriate for any reason, I hope I can forgive you in a timely fashion. I was led to your blog through Michael Voris's you-tube video. His "Church Militant" was the first catholic blog I found, where catholic teaching was properly presented. I saw Church Militant as a gift, an incredible blessing, at a time when all Catholics I knew seemed very mistaken about important Church teachings, and unaware of the crisis in the Church. Therefore, when I saw Mr Voris's video on Rosica's (I really can not call him "father Rosica" in good conscience) views on ecumenism, I was very troubled by a very serious omission in the report. I know how well-informed Mr Voris is, so it couldn't have been due to ignorance. Not long ago I saw pope Francis's message to a conference led by Kenneth Copeland, recorded by who the pope called his close friend, Mr Tony Palmer (a former advocate of Copeland's cause in South Africa, who later called himself an Anglican Bishop). In its meaning the pope's message was very similar to the one Rosica spreads. Mr Copleand (or was it Tony Palme?) announced that the reformation was over. Later, Tony Palmer recorded his own message, where he called faithfulness to doctrine "spiritual racism". Afterwards Tony Palmer and Kenneth Copeland (and other people) were photographed with pope Francis at some meeting in the Vatican. Days after the meeting Palmer, whom the pope asked to be his ambassador to the emergent church (I think I recall correctly) died in a motorcycle accident. If I am not mistaken, the pope insisted that Bishop Palmer would receive a catholic burial. I am distraught at the handling of Rosica's actions and views by Mr Voris's reports. What is happening to you is a very important story to tell, but it should be told honestly. I strongly believe that the time to speak half-truths is over. At any given time half-truths can be very damaging, but now it is more serious an offence to truth than ever. I am so sorry this is happening to you. When a member of the Church places a cross on one's shoulders, one should be very grateful to God for that is the way Our Lord suffered. Very few receive that grace in full force (Padre Pio comes to mind.) Be assured of my prayers for you and also for your enemies that they will repent and embrace the Gospel of Christ and beg the Lord for His mercy. God bless you and keep you. What is happening to you is absolutely despicable. I absolutely cannot believe that the pope does not know about this Rosica prelate. If he does know and allows him to remain in his position, grave danger to their souls, if the pope does not know what Rosica is doing (and has done), grave danger to the their souls. Either way, this pope is causing/allowing so much excruciating pain to faithful Catholics. I am so tempted towards anger which is an imperfection I am working on this Holy Lent, so this is an occasion for me to practice meekness. However, that does not prevent me from writing some very respectful letters to my bishop here in St. Louis, MO, and to the pope. God bless you. I hope messages of "God allows great trials to those he dearly loves" is somehow comforting to you, because I know from experience. It can be extremely difficult to see/accept that at first, but after time and much prayer, one can see that this is so very true. I have a son who has told us he is gay and two other sons who support him and two other sons who are married but have no use for the faith. Out of five sons, none that believe or practice my beloved religion. It is heartbreaking. I am praying for you and your recent heartbreak. I know you must be thinking "why me? "; it's because He loves you very much. We are giving this bad news to the catholic faithfuls from Italy where nobody knows about this lawsuit. We pray for you ! May Our Blessed Lord strengthen and sustain you. Thank you for your witness and fidelity to the Truth. PERHAPS YOU SHOULD HAVE A BROTHER ATTORNEY SET UP A LEGAL DEFENSE FUND TO WHICH THERE WOULD BE MANY CONTRIBUTIONS. LET US KNOW IF YOU NEED ASSISTANCE. David I am very sad about the way people continue to go after Fr. Thomas Rosica. I think we all need to reflect deeper on today's Gospel. There are a lot better ways to get the changes we want to see then to continue going after a priest. There we have it. 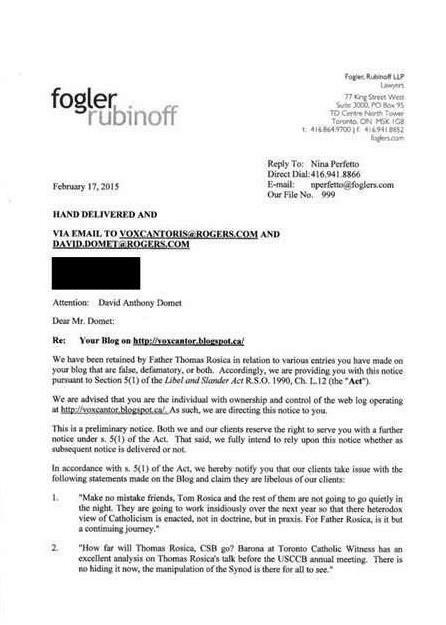 Vatican money and clerics are paying lawyers to shut down Catholic bloggers and their opinions. Remember this the next time you put money in the plate. Disgusting.